While Polar Bear watching in Churchill, Manitoba, tourists get a close encounter with a polar bear who has emerged from the tundra and decides crossing the gravel road is the next leg of his journey. The tourists are thrilled with being this close to a Polar Bear but they should always be prepared as danger is very near depending on the Polar Bear's mood. While crossing the road, the Polar Bear does not seem too distracted by the tourists but keeps an eye on them to ensure its safety. As the Polar Bear scours out the region around the Hudson Bay in Churchill, Manitoba, he is very hungry while waiting for the snow and cold temperatures to set in. Not every bear watching trip will provide prime viewing for tourists, but one never knows where and when a Polar Bear will appear before the area becomes frozen. After that, these marine mammals will be found hunting down their main meal of Ringed Seal in the cold waters of the Hudson Bay. Picture of a Polar Bear crossing the road in Churchill, Manitoba where a group of tourists are prepared with their cameras. 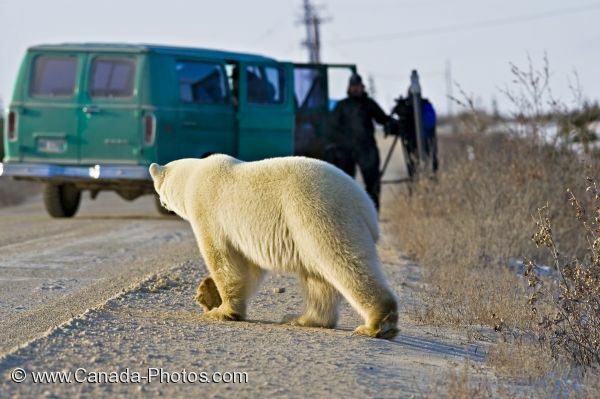 Polar Bear, Ursus maritimus, crossing the road near tourists in Hudson Bay, Churchill, Manitoba, Canada.